C celebrated her birthday a couple of weeks ago, and as A managed to miss it for a wedding in Germany, he decided to pull out all the stops to show C a good time the weekend after. 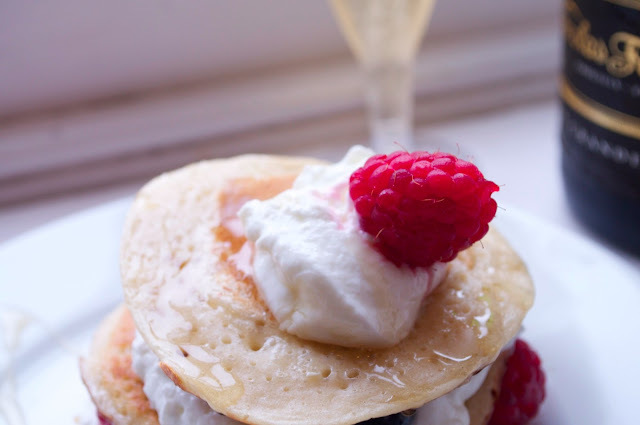 Knowing that the surest way to C's heart is through her stomach, A made sure that food and wine flowed aplenty and this simple recipe for summery pancakes was first of a series of meals that C was treated to over the course of two days. As there were loads of activities (yoga, photography exhibitions and lots more besides) packed into the weekend, A looked for something quick and easy but nonetheless impressive, to fill C up on the Saturday morning. There are few quicker things to make than pancakes, and this must be about the quickest possible way to make them. Adapting one of Jamie's recipes, the result was a delicious fruity breakfast that probably wasn't too unhealthy (A hopes!). The trick to these pancakes is the ratio of ingredients. You want to keep the ratio of milk and self raising flour even, so take a mug and fill it with milk, then add an equal amount of self-raising flour, one egg and a twist of salt, then whisk until the batter is smooth. A used an electric whisk and had the batter made up in 5 minutes flat. Then put a little bit of neutral tasting oil in a pan and heat it. Once the oil is hot, add a little under half a ladle of batter to make small rounds about 3-4 inches in diameter, then heat. You may want to discard the first one, as it will come out quite oily. Once the pancakes are done on one side, flip them and ensure they are cooked on both sides. Cooking should take about 2-3 minutes a pancake and you'll have a batch made up from scratch in less than quarter of an hour. 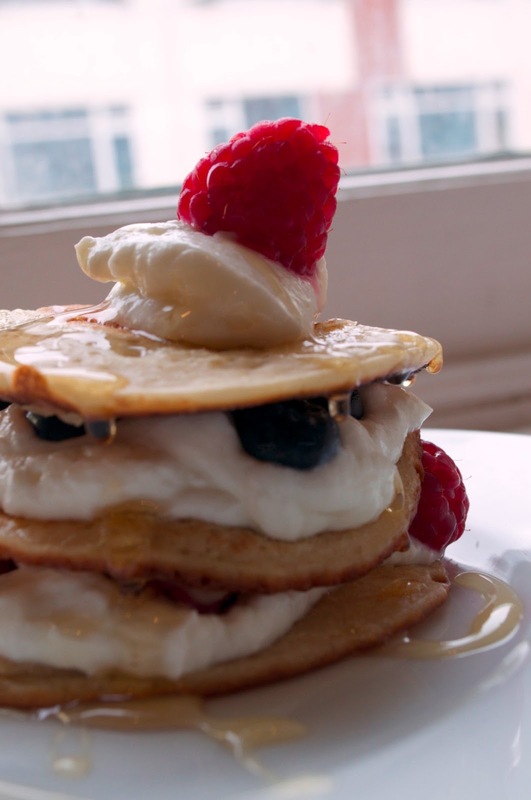 To spruce up these simple pancakes, A made three of them into a stack, placing low fat greek yoghurt and blueberries between the one pair of pancakes and greek yoghurt and raspberries between the the other. A drizzle of honey then finished them off and a garnish of yoghurt and fruit finished them off. 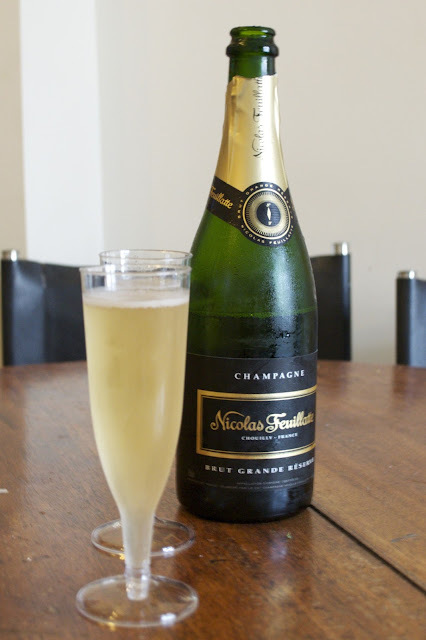 As it was a birthday treat, A served the stacks up with a bottle of Nicholas Feuillatte Grande Reserve Champagne. At the risk of sounding pompous, this is one of A's favourite Champagnes as it tastes pretty good and represents very good value for money. It also has a personal connection for A: as well as living in Germany, A used to work in the Champagne region of France. Chouilly (where the Feuillatte cave is based) was a short distance away from A's workplace and A used to pick Champagne up directly from the family itself for special occasions. When Sainsbury's have the stuff on special offer, what more excuse do you need? 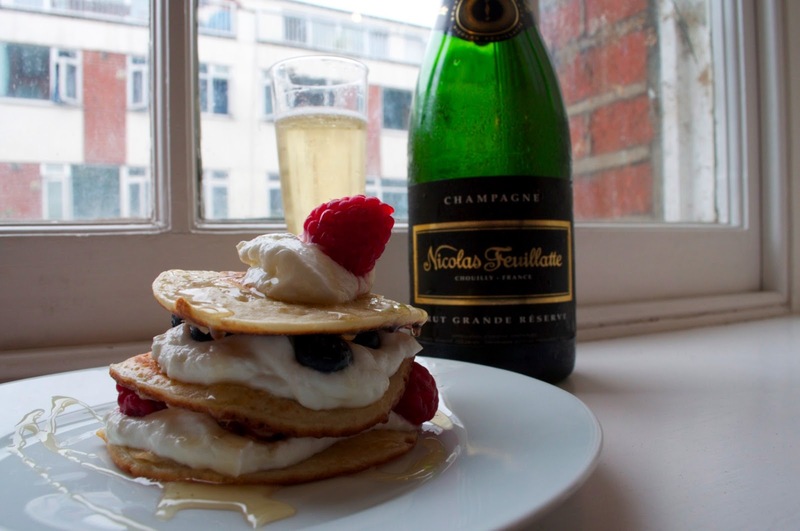 So there you have it: a superb Champagne brunch for two, at less than a tenner a head. Delicious and a bargain!